The Houston Independent School District is celebrating Black History Month by commemorating district alumni and staff who are considered groundbreakers and trailblazers. The theme for this year’s celebration was created to align with the Association for the Study of African-American Life and History’s (ASALH) theme “Black Migrations.” While previous themes were inclusive of earlier centuries, this theme focuses specifically on the 20th century through today. 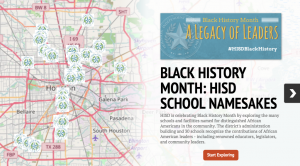 This entry was posted in Achievement/Recognition, News and tagged Black HIstory Month on January 31, 2019 by HISD Communications. 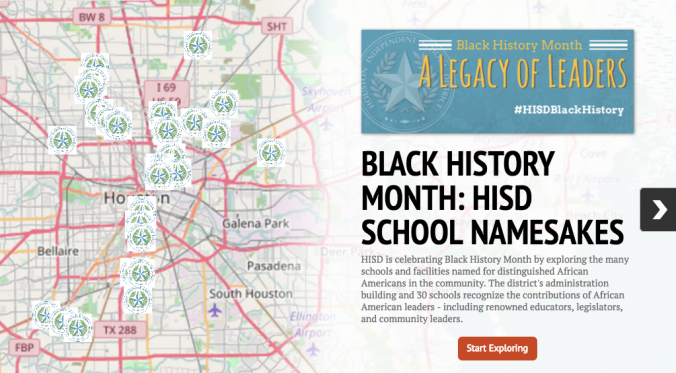 As Black History Month draws to a close, take a virtual tour of the district to visit the many schools named after renowned African American leaders, and learn a little about the historical contributions of those educators, legislators and community leaders. Even the district’s administration building, the Hattie Mae White Educational Support Center, has an important namesake you can learn more about. Click image for an interactive tour. This entry was posted in Achievement/Recognition, News and tagged Black HIstory Month on February 22, 2017 by HISD Communications. HISD is celebrating Black History Month by exploring the many schools named for distinguished African Americans in the community. The district has more than 30 schools that recognize the contributions of African American leaders ranging from renowned educators to legislators to community leaders. The first week’s story focused on early childhood centers and elementary schools. Last week, the series continued with middle and combination schools, and this third week is high schools, alternative schools, and the Hattie Mae White Educational Support Center. Hattie Mae White Educational Support Center – When former teacher Hattie Mae White (1916-1993) was elected to the HISD Board of Education in 1958, she was the first African American elected to public office in Texas in the 20th century. She led the effort to desegregate Houston’s schools, undeterred despite racist attacks. White also was elected to the YWCA Metropolitan Board of Directors, where she served for six years. After being defeated for a third term with HISD, she returned to teaching and retired at age 70. She attended Booker T. Washington High School and the former Texas Southern University before graduating from what is now Prairie View A&M University. The HISD district headquarters building on Richmond was named in her honor, as is the new building on W. 18th Street that replaced it. This entry was posted in Achievement/Recognition, High Schools and tagged Black HIstory Month on February 15, 2017 by HISD Communications. This entry was posted in Achievement/Recognition, Middle Schools and tagged Black HIstory Month on February 8, 2017 by HISD Communications. George Walker Jr. is an accomplished athlete who was All-American and All-State in football at Westbury High School, graduated in 2004, and went on to play for the University of Texas. 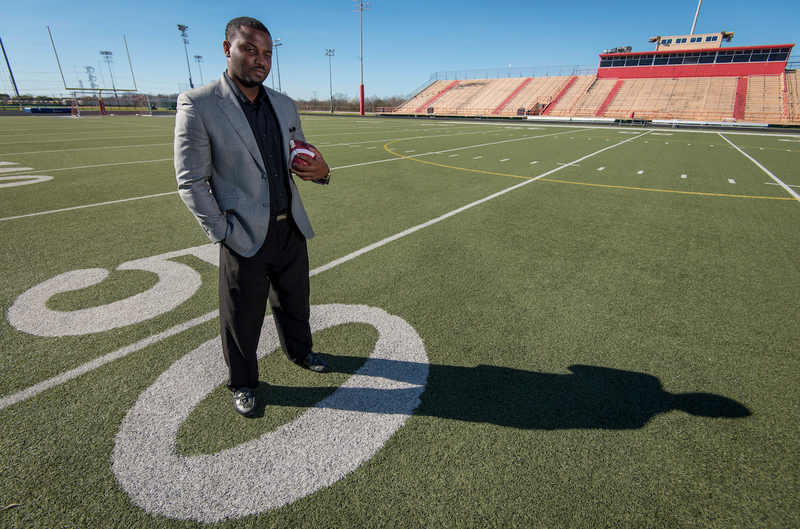 Now he is back at HISD, where he was recently named stadium director of the Joe Kelly Butler Athletic Complex – the first African American to hold the position. In this edition of I Am HISD, Walker talks about his new role and how he benefitted from participating in sports. You grew up in HISD and were a star student athlete at Westbury. What sports did you participate in and what impact did your involvement in sports have on you? This entry was posted in Athletics, I Am HISD and tagged Black HIstory Month, Butler Athletic Complex, George Walker Jr. on February 3, 2017 by HISD Communications. Black History Month is a time to celebrate the richness of African-American culture and recognize the central role of African Americans in U.S. history, as well as the numerous contributions African Americans have made to society. This entry was posted in News, Parents, Special events and tagged Black HIstory Month on February 2, 2017 by HISD Communications. This entry was posted in Elementary Schools and tagged Black HIstory Month on February 1, 2017 by HISD Communications. Editor’s Note: Black History Month runs from Monday, Feb. 1, through Monday, Feb. 29, this year, and HISD is celebrating with a series of weekly stories recognizing distinguished African Americans who graduated from HISD high schools. This final article focuses on alumni who went on to have successful careers in education. Previous articles highlighted athletes, artists, politicians, and media professionals. Despite laws forbidding the education of slaves and generations of African Americans being denied the right to schooling, African-American leaders have always stressed that the key to success is a high-quality education. In the HISD family, many distinguished African-American alumni strived to help others overcome generations of poverty and illiteracy by gaining an education. This entry was posted in Special events and tagged BHM, Black HIstory Month on February 29, 2016 by HISD Communications. How well do you know your distinguished alumni from HISD? Take our quiz and find out! In honor of Black History Month this year, the district’s Communications team has put together a question-and-answer-style slideshow that highlights 24 different African-American graduates, along with the years they earned their high-school diplomas. Among those featured are professional athletes, artists, elected officials, and more. Black History Month runs from Feb. 1 through Feb. 29. This entry was posted in Achievement/Recognition, Special events and tagged Black HIstory Month on February 12, 2016 by HISD Communications. Editor’s Note: Black History Month runs from Monday, Feb. 1, through Monday, Feb. 29, this year, and HISD is celebrating with a series of weekly stories recognizing distinguished African Americans who graduated from district high schools. This first article focuses on alumni who went on to have successful athletic careers. Others will spotlight artists, educators, legislators, and those with careers in radio, TV, and film. 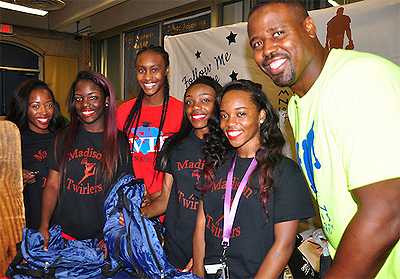 HISD alumnus Moran Norris regularly gives back to the schools he attended, including Madison High School (pictured). Here, he is distributing backpacks to incoming freshmen during the fall 2015 orientation. From Wimbledon finalist and Olympic gold-medalist Zina Garrison (Sterling, Class of 1982) to National Basketball Association Rookie of the Year and Olympic bronze-medalist Chukwuemeka Noubuisi “Emeka” Okafor (Bellaire, 2001), HISD has produced dozens of African-American graduates who have gone on to enjoy impressive careers in professional sports. This entry was posted in Achievement/Recognition, Special events and tagged Black HIstory Month, distinguished alumni on February 1, 2016 by HISD Communications.